So Manny Pacquiao wasn't the only one who lost yesterday. The Real Singapore website was no longer accessible yesterday after the Government said so. 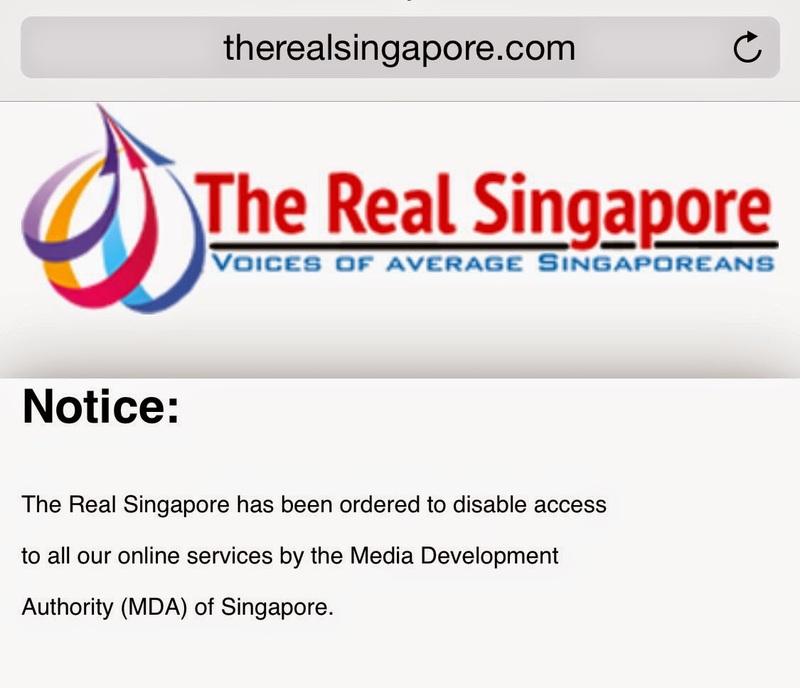 The Media Authority of Singapore ("MDA") has suspended the statutory class licence for Ai Takagi and Yang Kaiheng to operate the website www.therealsingapore.com ("TRS"), and other related computer on-line services such as the TRS Facebook Page, Twitter Page and mobile applications. The MDA is satisfied that Takagi and Yang have contravened the Internet Code of Practice (ICOP). They have published prohibited material as defined by the Code to be objectionable on the grounds of public interest, public order and national harmony. 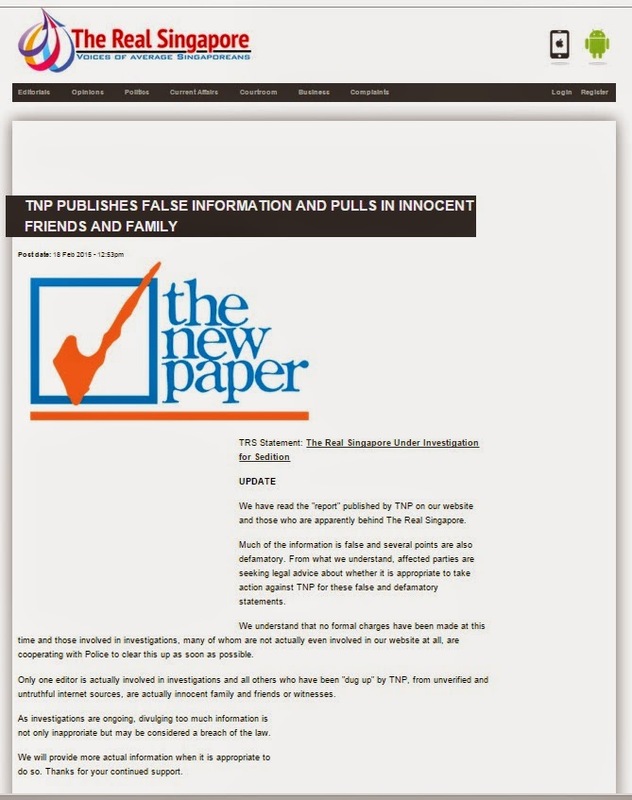 The MDA has noted that TRS has deliberately fabricated articles and falsely attributed them to innocent parties. 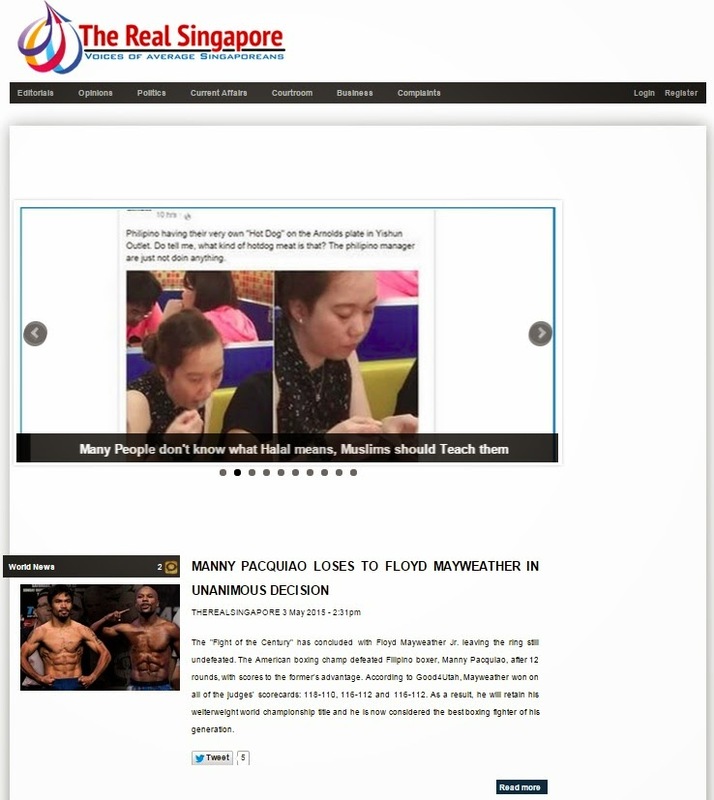 TRS has also inserted falsehoods in articles that were either plagiarised from local news sources or sent in by contributors so as to make the articles more inflammatory. At least two out of TRS’s three known editors are believed to be foreigners – Takagi is Australian, while another editor Melanie Tan is believed to be Malaysian. The foreign editors were responsible for several articles that sought to incite anti-foreigner sentiments in Singapore. Previously, Takagi and Yang were out of the jurisdiction of the Broadcasting Act as they were running their operations from outside Singapore. However, since December, the two of them have been running their operations from Singapore, bringing them within the jurisdiction of the Broadcasting Act. Most recently, the MDA notes that Takagi and Yang have been charged with seven counts of publishing seditious articles on TRS and the TRS Facebook page. They have also been charged with refusing to comply with written orders to produce documents considered by the police investigator to be necessary for the investigation. They have also refused to disclose how much advertising revenue they have been collecting. Further, TRS has continued to publish material that contravenes the ICOP even after Takagi and Yang were charged. The MDA has notified Takagi and Yang to immediately stop posting any more articles on TRS and related services; and within six hours disable access to their website and related computer on-line services. Thereafter, they are not to resume operations under any other name. They have also been given seven days to provide information relating to TRS’s operations and to make representations as to why their class licence should not be cancelled. My first reaction was, wow, I didn't know government agencies work on Sundays. My second reaction was, what is the "statutory class licence"? I didn't know TRS had a licence in the first place. Since then, other websites like Mothership.sg and The Independent have been asked to register as well. therealsingapore.com was not one of them. Here's the thing: Under the 1996 Class Licence Scheme in the Broadcasting Act, websites that aren't required to register "are automatically class licensed". Did you know this? I didn't know this. I remember in 2013, many were protesting the new regulation that required certain news sites to register. Now it seems that since 1996, all Singapore websites have been given this invisible class licence which MDA can suspend whether you have registered or not. I guess the difference is if you register, you have to put up a $50,000 performance bond which you could lose if MDA doesn't like what you're doing. Since TRS isn't registered, I'm surprised TRS was so compliant and shut down as it was told by MDA. As recently as February, TRS was denying the allegations in The New Paper report. And to whoever started the "Shut down TRS" online petition last year, well, you got your wish. 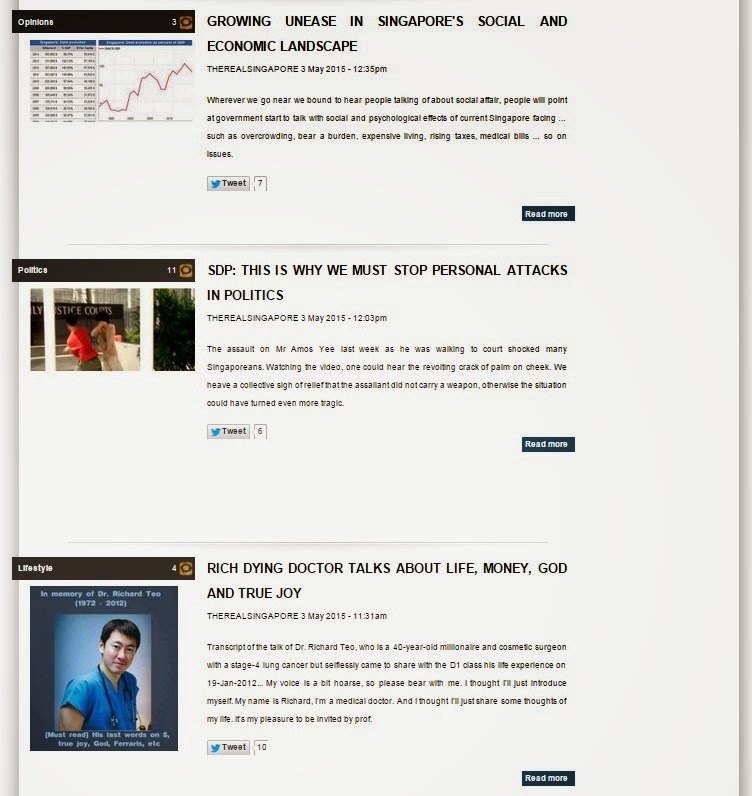 I, too, am not very happy with TRS for republishing a blog post of mine on its website without my knowledge. But is TRS gone for good? Will there be a TRS Emeritus? Who knows? 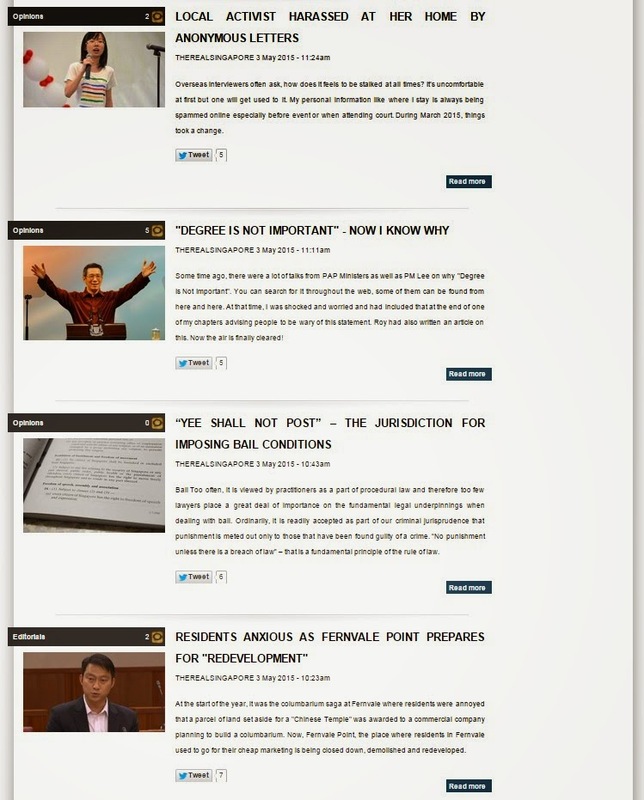 If you need your fix for some anti-Government content, you can still go to TR Emeritus, The Online Citizen, All Singapore Stuff or the blog of my biggest fan, Andrew Loh. 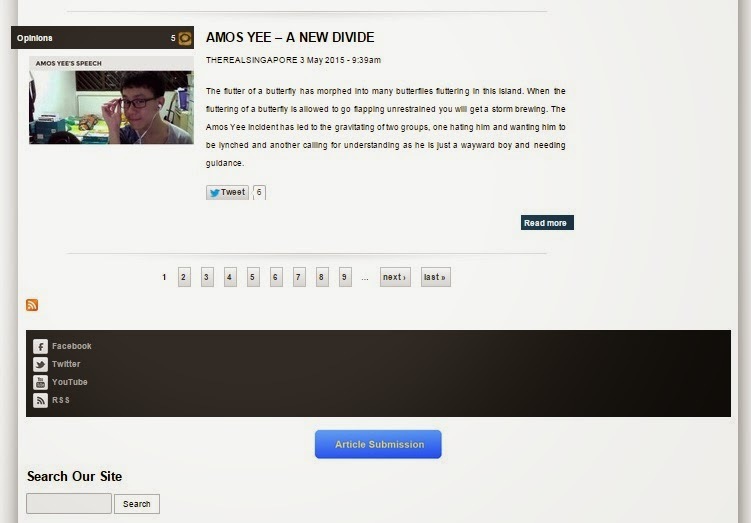 Fittingly, the last story at the bottom of the page is about Amos Yee, who like TRS, was told he couldn't post anything online any more. But unlike TRS, Yee didn't comply. 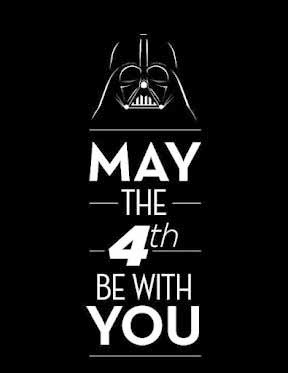 BTW, since today is Star Wars Day, I want to say, "May the 4th be with you", but clearly, the Force is with MDA.